Our aim is to save families time, money and stress at one of the most difficult times of their lives. From our head office in Hertfordshire, we offer a full probate administration service as well as estate planning, inheritance tax advice and the drafting of Wills, Trusts and Lasting Powers of Attorney, throughout the Home Counties and into London. The Probate Bureau is a family run business with a friendly and professional team on hand to guide you through an increasingly complex area of legal practice. If you are looking for professional help or just want to know how to administer an estate yourself, you have come to the right place. We can tell you everything you need to know about administering a loved one's estate. Before you do anything else call us now to check what you should do, and more importantly, what you really shouldn't. For a little more insight, why not download our 7 Stage Checklist? A professionally drafted Will is arguably the most important document you'll ever own. A good Will translates what is important to you and your family into a sound legal document. A Lasting Power of Attorney is one of the most considerate things you can do for your family. You probably have plans for your life, but have you planned your finances accordingly? TPB Financial Services can help you with that all-important plan. There are not enough fully qualified independent financial advisers to go around; call us now for a chat. 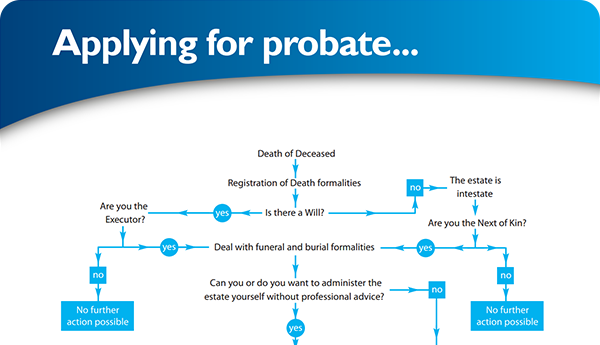 Probate comes from the Latin verb 'probare' which means 'to prove'. When someone dies their Will (or their statutory one if they had not written one) needs to be proved or "probated" to enable their Executor (or Personal Representative/legal Next of Kin if there is no Will) to cash in or transfer property and assets. The document issued by the Court is often referred to as a Grant of Representation or a Grant of Probate if there is a Will. If someone dies without leaving a valid Will (that is "intestate"), the document is referred to as a 'Grant of Letters of Administration'. Once a Grant is obtained the estate can be distributed to the rightful beneficiaries. However, in many cases, there are certain conditions, like if a single person's estate is valued over the Nil Rate Band (currently £325,000) which means a Form IHT400 needs to be completed and submitted before a Grant of Representation can be applied for. This is far from straightforward and we would urge you to contact us for some guidance before you do anything. Contrary to popular belief, the 'probate process' is no quicker if the deceased left a Will than dying without one (dying intestate). In fact in many cases a poorly drafted Will, or an out of date one, can cause more problems than no Will at all. Our legal firm was established in 1999 in response to the dissatisfaction people were experiencing with some of the traditional providers of estate administration services. Since then we have been able to demonstrate that we can administer estates in half the time and at half the cost of most of those providers. You may find these two Guardian articles useful; Guardian Article: The £600m RIP-off and Guardian Article: Avoid a final rip-off. Furthermore, in conjunction with our sister company TPB Financial Services, we are able to offer bespoke legal and financial solutions to families thereby saving families even more money. CALL US NOW, AN EXPERIENCED ADMINISTRATOR IS ON HAND TO ANSWER YOUR QUESTIONS. Please Note: This firm complies with the IPW Code of Practice. We comply with the Solicitors Introduction and Referral Code published by the Law Society, and any Solicitor to whom we may refer you is an independent professional from whom you will receive impartial and confidential advice.